LEXINGTON, Ky. — A Kentucky couple has issued an adoption offer to abortion-minded mothers after viewing one of the expose’ videos of the abortion giant Planned Parenthood. Kevin and Nicole Cook watched the fourth investigative video this past July, which featured staff from Planned Parenthood of the Rocky Mountains sifting through the body parts of an aborted child. “[A]nother boy!” one technician exclaimed. The footage “shattered” the Cook’s heart. Nicole had suffered a miscarriage over a year ago, and has struggled with infertility ever since. 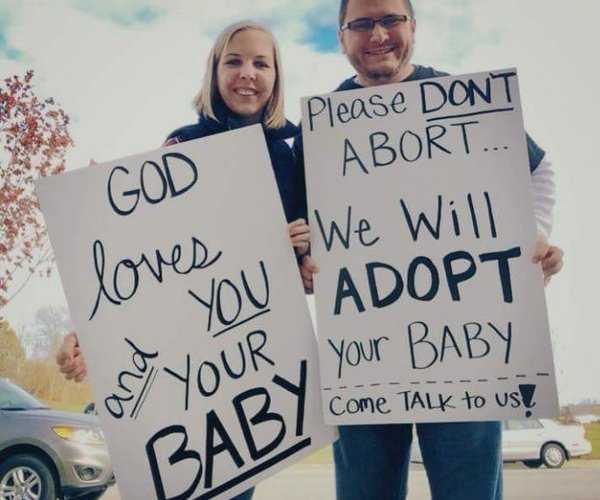 The Cooks soon got involved with sidewalk ministry outside of an abortion facility in Lexington, creating a sign that read, “Please don’t abort. We will adopt your baby.” They posted a photo of the experience on Facebook and wrote about their desire to adopt, which soon went viral. The couple continues to await an open door to adopt in hopes of saving a life, and would like to help point as many mothers as they can to adoption agencies.